In December I read three very short books (the longest was under 130 pages), all in translation, two French titles and one German. I have read a variety of positive reviews about Georges Simenon’s rather famous works (recently Isabella of Magnificent Octopus was working through his back catalog), and I have picked up a total of five novels by him in preparation for my own enjoyment. Richard’s less than thrilled December review of The Widow stopped me up short and finally did what all the positive reviews hadn’t managed – I actually read a book by Simenon. Maigret and the Hundred Gibbets (trans. Tony White) was my introduction to Inspector Maigret, one of the most famous detectives in literature – one of the great “moral” detectives. He and his stories are known less for their action and mystery and more for the journey Maigret embarks on each time as he comes closer to understanding the people around him and himself. In the Hundered Gibbits Maigret casually follows a nervous, down-on-his-luck looking fellow whom he had observed posting thousand-franc notes as ‘Printed Matter’. Discreetly accompanying the man to Brussels via train, Maigret takes the opportunity to switch out his suitcase. When the man discovers that his suitcase is gone, he promptly shoots himself. Shocked and feeling more than a little guilty, Maigret is compelled to find out what the man was up to. His investigation leads him all the way to Liege (Simenon’s birthplace, incidentally) to a garret room where the story of a horrible night years ago is retold (and relieved) and the events which brought that poor man to his miserable end are revealed – too late of course. I wasn’t blown away by the story, or by Maigret, although the details and characterizations were pretty excellent. It was well constructed but just didn’t grab me. I think I will try again – perhaps read something non-Maigret, such as Red Lights which I have on my shelf. I do really want to see some of the screen versions of the Maigret stories – I imagine they translate well. From the wiki article it appears that I have many to choose from. Does anyone have a suggestion about where to start/your favorite on-screen Maigret? Also discovered through Isabella of Magnificent Octopus was Adalbert Stifter’s Rock Crystal (trans. Elizabeth Mayer and Marianne Moore), which I pulled off my shelf as a bit of holiday reading. Set on Christmas Eve in a remote village in the Alps, it is the briefly epic tale of two children’s journey from their home to a neighboring village and back, through the high pass and a sudden snowstorm. The writing is deceptively simple, and the story plays out gently but with such subtle suspense that I nearly fell out of my chair before I realized I was on the edge of the seat. It is icily beautiful and not really what you would suspect. I am super curious about Stifter and want to venture further into the work of a writer whom Thomas Mann called “one of the most extraordinary, the most enigmatic, the most secretly daring and the most strangely gripping narrators in world literature” (thanks to my lovely NYRB edition for that quote – reminds me that I ALSO need to read some Thomas Mann…). I just might make this book a Christmas reading habit. 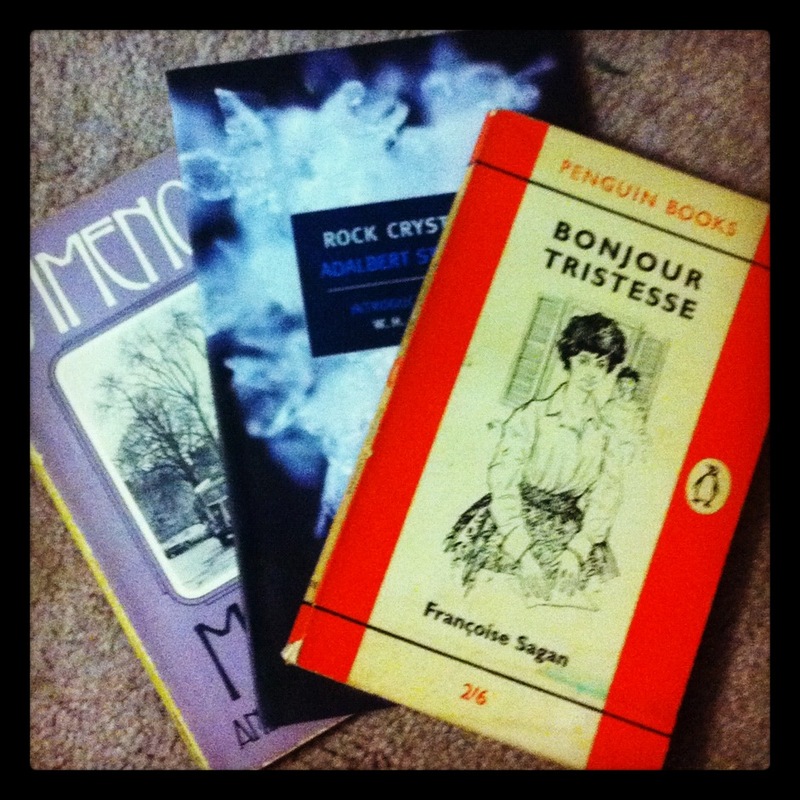 I am culling books in preparation for my move (or avoiding doing so, at the moment…) Would anyone like my copy of Bonjour Tristesse? The cover is the tiniest bit loose but otherwise it is holding together very well, and it’s a 1962 edition I believe. Up for grabs – I don’t mind shipping internationally. I have called Stifter the pickled herring of German literature. Some people love pickled herring! Hmm, pickled herring is still on my “foods to try” list. I should get on that. I’ve read almost all of Sagan when I was 16 and she did impress me incredibly. I recently felt the urge to re-read her and biographies and what not. 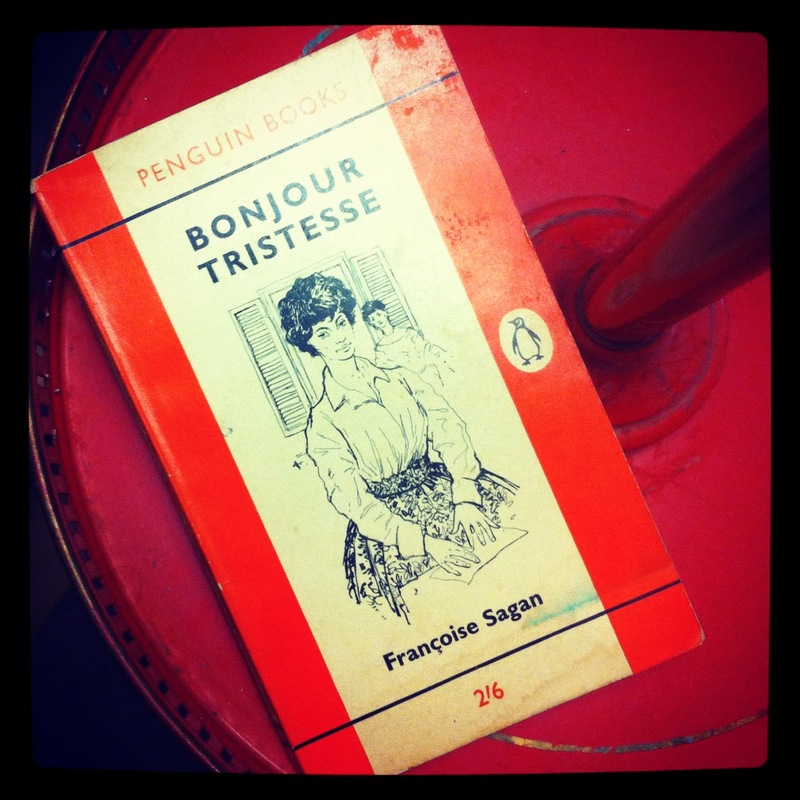 I thought Bonjour Tristesse was perfect, to be honest. She is a real cynic. I’m not sure that my take on relationships in general and marriage hasn’t been greatly influenced by her. My first non Maigret waits to be read this year and oh well Stifter, I’m more in a Sagan mood I think at the moment but next Christmas comes soon enough. I read one or two Maigrets last year. The charcaters are really well done but I’m not that into Maigret. Bit too old fashioned with the cooking wife and the pipe. Maigret’s wife didn’t figure into the story I read much at all so I didn’t get a good feel for her. Must read at least one more (I have two more to choose from). I was very impressed with the mechanics of Sagan’s book, just didn’t connect with the characters. Could have been my mood. I’ll see what happens the second time round.